Thalictrums are some of the most intriguing plants available to gardeners. These plants are grown all over the world, so there is a variety that is undoubtedly suited to your garden. 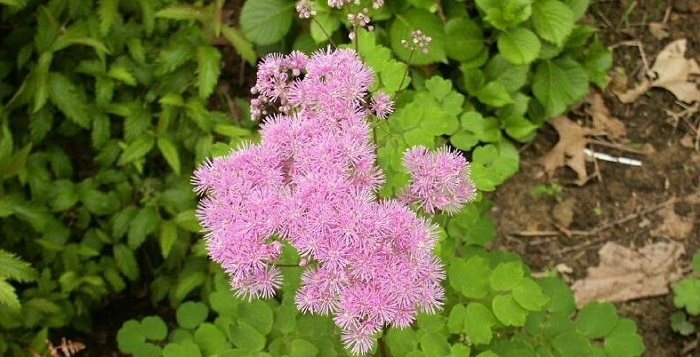 Thalictrum is available in colors ranging from white, to pink, to yellow, to violet. Heights range from two feet to eight feet. I have read that they require a moist environment in shade, but I have grown them in anything from mostly sun to complete shade. They can be used in anything from a wild to a cultivated garden. They can be back of the border plants, or amazing specimens for the front of the bed. 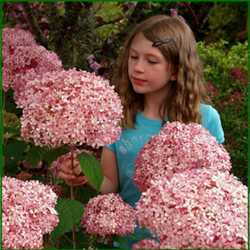 One of their great features is their beauty when out of bloom and the denseness of the panicles when they are in bloom. They are incredibly flexible. They are easy care plants. They do like a humus rich soil, although I find that some varieties can handle substantial neglect. Taller ones, like Thalictrum 'Splendide', can need staking. 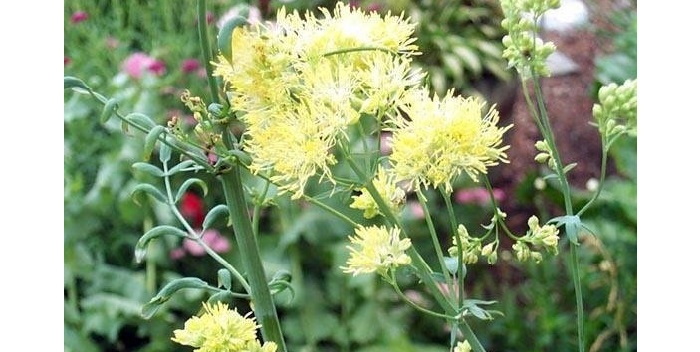 I have never needed to stake Thalictrum rochebrunianum, which is one of the tallest. Most meadow rues are late to emerge, generally in mid to late spring. At least some of them, like rochebrunianum, reseed. I originally purchased 8 and ended up with 20 after a few years! They feature a basil clump of fine textured foliage that can sometimes be mistaken for columbine foliage. If you order Thalictrum, as I have, you sometimes discover that the plants are columbines. Thalictrum rochebrunianum, with its beautiful purple flowers with yellow stamens, originated in Japan. It is hardy in zones 4 to 7. It grows four to six feet, with a spread of two to three feet, and blooms from July to September in zone 5a. It can take full sun to part shade. It's fabulous because the stems look frosted. And once you buy a few, you should always have them, because as I noted above, it gently reseeds, but the stems are so slender that it does not interfere with other plants. It is unusual even among Thalictrums because the stems appear to be covered with transparent frost. The beautiful flowers are lavender purple. It is widely available at a reasonable price. Thalictrum aquilegifolium 'Sparkler' is one of my favorites. It is a Terra Nova Nursery introduction, and a very tough plant. I acquired two in 2006, and moved one of them to my new yard in 2012. It's still flourishing, and interestingly enough, it was in full sun, and is now in mostly shade. The biggest difference is that it grows a foot taller. "I do not cultivate this plant. It grows wild in my area. 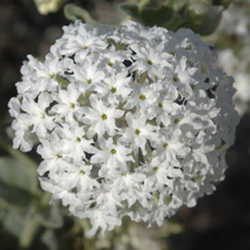 This is a tall plant with cream to white plumes of small flowers at the top. Found in swamps, along streambanks and damp meadows from Ontario east to Newfoundland, south to Georgia, west to Mississippi and north into Illinois and into Michigan. The plants can get quite tall, over 6 feet in some instances and the flower plumes are popular with bees and butterflies." For fans of yellow, the is Thalictrum flavum ssp. glaucum, hardy in zones 5-8, and two feet tall and two feet wide. Otherwise, it enjoys the same sun to shade conditions of the others. 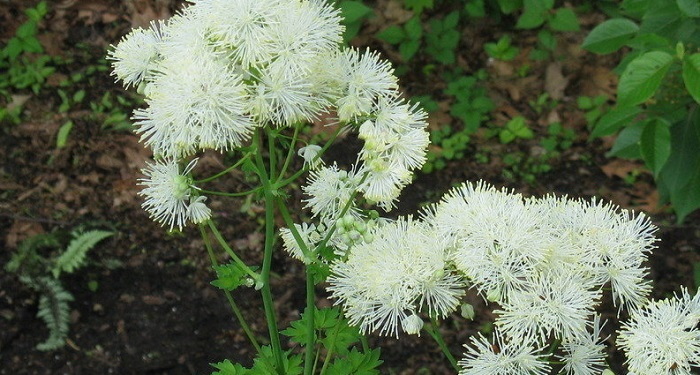 It is also labeled as Thalictrum speciosissimum subsp. speciosissimum. Another wonderful Thalictrum is 'Black Stockings'. Hardy from zones 4-9, it gets its name from its nearly black stems topped with beautiful fluffy pink to lavender flowers that are some of the largest in the plant family. It blooms for week and from experience requires no care other than deadheading and then cutting to the ground at the end of the season. I would encourage you not to waste this plant at the back of the border, as I did originally. You want to put this plant where it can be seen! 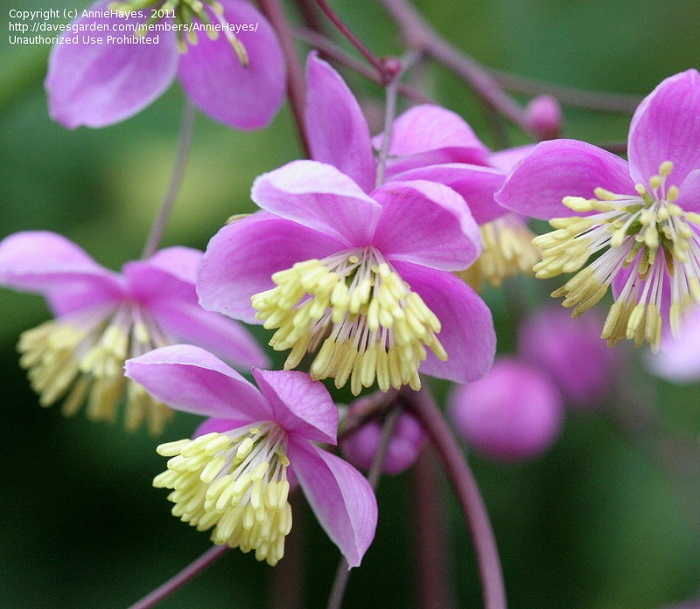 It was actually discovered as a garden seedling, and is a cross between Thalictrum elegans and Thalictrum delavayi. What fabulous parents! This plant is anything from 5 to 9 feet and possesses 2 foot wide reddish stalks, carrying ferny foliage, and looking like a star, carrying copious lavender pink flowers. The floral section is massive, but light, and the flowers cover the top three feet of the plant. 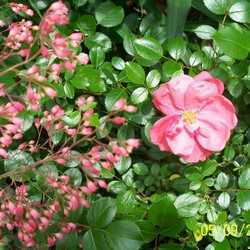 It blooms over a long period from June to September in the middle zones, and amazingly, is hardy to zone 3. And it comes in white, which is even newer. If you would like to see some more amazing images and trial test results of Thalictrums, I can strongly recommend the Chicago Botanic Garden's trials for this genus. Since the trials were done and the report printed in 2011, it does include some of the newest, but there are excellent pictures, along with one to four star ratings. It is a great resource. The Chicago Botanic Garden is located in horticultural zone 6a. I hope that you will try some of these wonderful plants. I have gotten much pleasure from them over the years.